“Losing a visionary is really hard,” said Brian Barish, president of Cambiar Investors LLC, and if anything that is an understatement. Steve Jobs had been leading Apple over past 14 years, and you will find few people that said he did a bad job. Jobs took Apple form being a company that was struggling to survive let alone compete, to a company that, briefly, was worth more than Exon Mobile. It is this accomplishment that people cite when calling Jobs one of the best businessmen of the 21st century. So what does Jobs resignation from his position as CEO of Apple mean for the company? As Matt McCormick, a money manager at Cincinnati- based Bahl & Gaynor Inc said, “The fortunes of Apple have been closely identified with Steve Jobs,”. This is a sentiment that is shared by most investors. According to Bloomberg when Jobs resigned he took almost 52 billion dollars off the S&P 500. This happens simultaneously as Apple’s own stock lost 17 billion. Similarly like Facebook-WhatsApp have 8 sets of stickers which are by default stored in the app. You don’t have to download this kind of Whatsapp smileys it’s purely free and ready to use with the app. It is hard to say what this means for the future of Apple, all we know at this point is that investors see the resignation of Jobs as a bad sign. People speculating on the future of Apple need to realize that Steve Jobs is the man that led Apple to the point it’s at now, but that he did not do it alone. This statement is reflected in the amazing products that Apple has introduced over the past years. 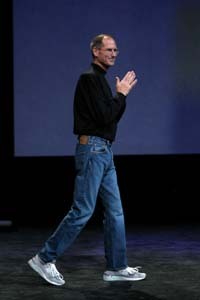 Now the question on people’s minds is whether Tim Cook is fit to fill Steve Jobs’ shoes. This is a question that will only be answered in time. For now it’s safe to say that the iPhone 5 will come, and the day-to-day business at Apple will continue as normal. The only thing that seems to be immediately threatened is Apple’s stock price. This entry is filed under Apple. You can follow any responses to this entry through the RSS 2.0 feed. Responses are currently closed, but you can trackback from your own site.